This is the BIG one – I know there are a few of us doing this today, but before we get onto the review, here’s yesterday’s Storify recap. I’ve been waiting a while for today. In fact, since the day the wax-sealed bottle of magic arrived on my doorstep, I’ve been planning the drinking day meticulously. When I set out on the #12BeersofXmas journey, the whole thing was built around drinking Strongman on Christmas Day, with dinner, like you would a fine wine. First problem though was getting through the wax! I’ve never had a bottle that has been wax sealed before but after some hacking, I finally revealed enough of the bottle top to get the opener latched on to release even more magic into Christmas Day. The beer poured very thickly, dark orange with a full on ‘craft haze’. The initial aroma was of oranges, peaches and sherbet. There were also big piney, citrusy notes to back up the initial fruit aromas. It was like a tropical paradise that was laced within hidden hops waiting to jump out and sink their fangs into me, releasing their magical venom. Ok, enough of that, what did it actually taste like? Well, there was the expected thick, resinous feel to the beer and I was instantly hit but the citrus fruit flavours, leaving an initial fresh, sweet hit of hops. There was a soft bitter finish and a slightly warming feel afterwards but the sweetness hangs around like your favourite Aunt or Uncle on Christmas Day. As the beer begins to warm, the flavours seem to be constantly changing with the exception of the big citrus notes and warming finish, I’ve been getting the aforementioned fruits, toffee, caramel and on occasions smoke. Somewhere in there is the original Un-human Cannonball, I know it’s there, but it’s like it’s playing hide and seek with me – one mouthful it’s there, and the next it’s gone. This is an absolute triumph of a beer from Magic Rock, and worked perfectly for me today. I’m so looking forward to next year’s release…. Saw this at the local beer and wine store. Figured “what the hell” it is a Christmas Beer. So.. Warm and spicy from its very first sip until it settles in the stomach, To Ol’s Christmas Ale is indeed shameless! It makes no apologies for its powerful alcohol, its abrasion or its big fruit flavor. 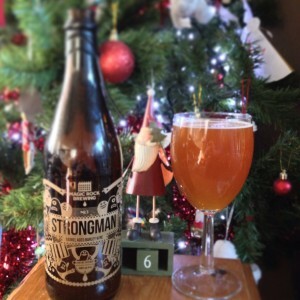 There’s a good bit of upfront pine and earthy hops compared to most Christmas ales out there. Behind the initial barrage of hops, I’m getting dark fruits namingly ripened plum/raisins with spicy Belgian yeast notes and a touch of alcohol. Flavor pronounced complex flavors bring it, big spicy yeast components, layered marmalade hints of citrus peel, pine resinous hop notes. Robust over ripened dark fruits a big component of this beer along with a blast of ethanol warmth. I don’t know much about To Øl, but I’m guessing their part of Denmark’s craft beer revolution along. This one has big medium to full bodied textures with lingering bitterness and an alcoholic finish, eat a meal and smoke a nice hand rolled cigar with this big Winter Belgian Strong Ale. Before you get anywhere near drinking this beer you’re aware of its reputation. It’s got a presence like a neighbourhood gangster. There’s a menace to it but you can’t help being intrugued by it. The link to the un- human cannonball makes it feel like another hard family member. The bottle is big, the wax is thick and the write up on the bottle builds up the beers stature. I half wondered if after all the build up I might be slightly disappointed by it. I didn’t let it intimidate me though. Serated knife in hand I went into the wax to find the cap. Once opened there was a very pleasant but not overpowering aroma. And on pouring that aroma grows. The thing with this beer is it’s colour. It’s such a vibrant orange like its alive. Like its lava erupting from a volcano. Again a big danger sign being waved at me! First sip was tasty. It’s got a thickness which I’m guessing is the barley wine genre then the flavours appear. There’s a lot of hop character to this but it’s obviously matured and is very smooth and delicious. I missed out on the unhuman cannonball but I can’t imagine it being as smooth and warming as this beauty. I would love to have bought more so I could taste them at different stages but the missus would go mental. Not only at £14 a bottle but the room I keep my beer in is soon to be turned into a nursery. In short I loved this beer. Big thick and hoppy smoothnes, full of flavour and threatening character. Really enjoyed reading about everyone’s Strongman experiences, I have that one in a few days time.